Lasers hurt less. It’s that simple. Laser therapy, in many cases, is a welcome alternative to surgery. In periodontal therapy and dental implant procedures, laser treatment helps preserve patient anatomy and stimulate and enhance the body’s natural ability to heal itself. Laser incisions seal lymphatic vessels and nerve endings, resulting in less inflammation, swelling, and pain. Often, anesthetic injections are unnecessary. This atraumatic treatment option reduces post-operative discomfort, allows for quicker recovery time without the side-effects of conventional procedures, and the absence of noisy drills encourages peace of mind for our patients. As doctors acquire lasers and master the use of this technology, more procedures are taking place in the dental office in fewer visits, without the need for a specialist. Lasers are ideal for treating gum disease and dental implant procedures. The superiority of laser therapy is unparalleled when compared to traditional treatment methods. Lasers easily remove tooth enamel decay, bone, and gum tissue with great precision while leaving the surrounding areas unaffected. This preserves more of the tooth structure and helps to maintain your natural teeth longer. In the case of periodontal pockets, for example, a thin tip is placed in the affected area and the laser energy sterilizes the area, killing the bacteria while leaving the healthy gums and tooth free of infection. As this procedure is minimally invasive, gum tissue reattaches to teeth faster, and our patients experience quicker healing times. We use lasers to remove calculus and plaque from implant surfaces without damaging the implant fixture or components. They are also used in gingival contouring, or the shaping of the gum line, when seating crowns on implants both for esthetic purposes as well as for patient comfort. Laser-assisted implant placement and recovery significantly reduces overall treatment time. In more serious instances, lasers can be used to remove failing implants. In such cases, we are able to remove the implant without damage to the adjacent bone or soft tissue or overheating the surrounding bone, which would cause problems postoperatively. There is no chance of contamination with titanium fragments or filings because we do not cut the implant or grind it. Laser energy has bactericidal properties that eliminate pathogenic bacteria from the affected area. After removing the implant and cleaning and disinfecting the site, the laser helps to stimulate healing of the soft and hard tissues. We use the state-of-the-art laser technology. At Mission Dental Implant Center, we use two types of lasers for both hard-tissue treatments such as bone regeneration, ridge augmentation, and tooth sensitivity, as well as soft-tissue procedures such as gum surgery, gingival contouring, nerve regeneration, and muscle attachment improvements. We use the LANAP protocol to remove only the diseased tissue without removing any of the healthy tissue, maintain the height of the tissue around teeth, minimize pain and discomfort to the patient, get a closure of the periodontal pocket wound and allow healing to take place. 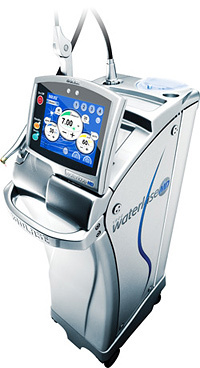 While the Waterlase iPlus laser is used in the medical and dental procedures, the EPIC™ Diode Laser was designed specifically for dentistry, and rarely requires local anesthesia. In brief, here’s how EPIC works: Micropulses of laser energy are generated as fast as one-ten-millionths of a second. These shorter, more powerful pulses create additional time for tissue to relax, which increases patient comfort during certain procedures, such as pain therapy. This lower-level laser is also ideal for procedures that require less power or heat, such as teeth whitening. Cosmetic procedures like teeth whitening have become as important to some of our patients as restoring functionality, and we are pleased to include this highly effective, in-office whitening method on our list of services.